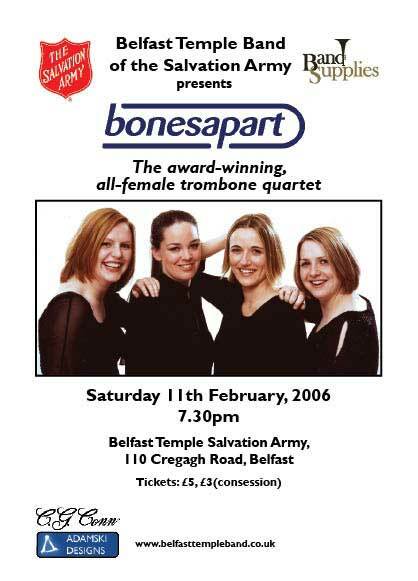 All female Trombone quartet Bones Apart are to play in Belfast Temple Salvation Army on the Cregagh Road, Belfast on Saturday 11th February 2006 at 7.30 pm. The world renowned group is made up of 4 of the most talented young ladies in the professional trobone circuit in the UK. They have travelled extensively performing as soloists, regularly play in the leading orchestras and bands, give masterclasses and are now sponsored by C.G.Conn trombones.